Per Clint's request he has asked me to write about what he has been doing in the SCCA arena. 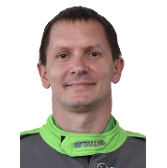 I have known Clint since before he could drive (he is now 35) and he has that rare God-given talent to be what many in SCCA call an "alien" driver, that he can drive anything, very fast, right off the bat. And yet when you ask Clint about his many Solo and Road Racing accomplishments over these years, it is like trying to pull teeth - he just does not dwell on the past but is focused, like a laser, on his current project. Clint to co-drive his Spitfire in D Prepared for the remainder of the season as an act of kindness. Clint quickly got my attention after winning the divisional championship in Duane’s car and then went to the solo nationals where Clint almost trophied his first time competing there. After this endeavor, Clint co-drove with me in my F500 in F Mod (DM then CM and finally FM) and he trophied several times in my car and his own through 2001. In 2002, Clint teamed up with Jay Stroud to go road racing in F500 where he, again quickly, started winning pretty much every road race that he ran over several years with several podiums at the Runoffs. After a very frustrating race in 2008 at the Double National at VIR Clint blew a motor almost every track session while also winning the pole for both races, we (Clint, Dan and myself) talked about a better, more reliable drive train for F500. We decided on the 600cc motorcycle drive train and converted a KBS Mk.5 chassis into the very first F600 in 2009. So Clint "disappeared" from the National road racing season while we developed, converted and campaigned F600's on the regional level for five years. We also formed a partnership for this endeavor - Formula 600 Racing, F6R, (www.formula600racing.com) to also start renting F600's with our goal of attracting drivers to this car. The result has been that there are now over 25 F600's around the country. During these years a lobbying effort has been made to allow the 600cc motorcycle drive train to be an alternative drive train in the F500 national class; finally, in October, 2013, the SCCA BOD did vote for this change and F600 is now part of the F500 national class. On top of this, a pro series has been started back in 2013 called The Formula 600 Challenge Series (www.theformula600challenge.com).